WASHINGTON DC trio TRANS AM, which describes itself as 'ATARI lovers in a PLAYSTATION world' will thrill punters with its heavy new-wave retro sounds this Sunday at the Northern Star Hotel. With its 'flying V' guitars and atmospheric keyboards TRANS AM is an exciting act, which flies in the face of musical trends. Using 'Atari-era technology' the band boasts an analog-only array of keyboards on stage, but rocks hard in a musical style, which could be described as 'Part YES, part DEVO and part KRAFTWERK'. 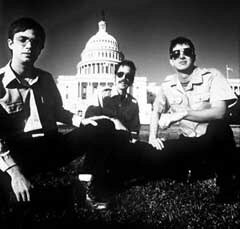 The group has toured with Chicago THRILL JOCKEY (the same label as CAKE) labelmates TORTOISE, SIX FINGERS, SATELLITE, PANSONIC and BANDUS ROCKUS ELECTRONICUS. For its debut Australian tour the band is touring with guitar/electronic outfit GERLING, whose most recent effort ENTER SPACE CAPSULE is enjoying high rotation on TRIPLE J. Newcastle's own heroes of dynamic rock and pop PURPLENE will complete the line up. Its fourth album FUTUREWORLD, the first non-import TRANS AM CD to be manufactured in Australia, is the band's first significant shift away from rock, into a more electronic field.